The days are getting shorter and the air is getting crisp which means fall is near. It's time to start thinking about the fall holidays and all those wonderful reasons to gather with family and friends. 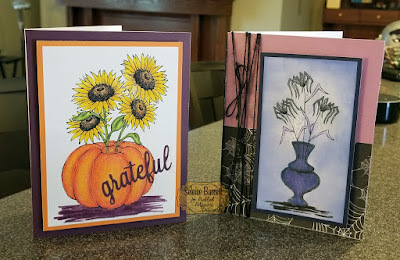 For those that aren't nearby, think about sending a card to let them know you're thinking of them. 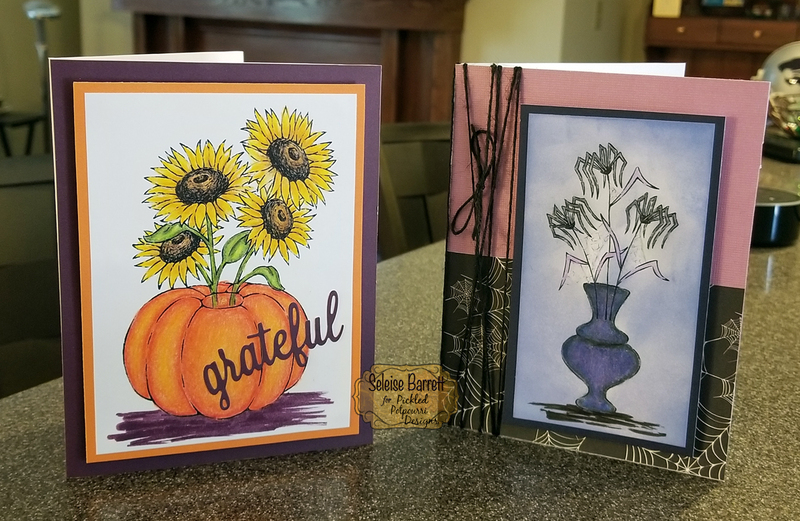 Festive Bouquets is a great digi set to use to for those thoughtful cards. There are six images. The bouquet holders are a vase, boots and pumpkin and the bouquets are spiders, sunflowers and holly and berries. It's so easy to line up the images in Word to create a combined image and you can put any of the bouquets in any of the bases or you can use any of the images on their own to create borders or backgrounds or more. I started with the vase and the spider bouquet. It's colored with prismacolor pencils in blues and purples. Some distress ink was added to create a background for the image and you can't see it in the photo, but there's clear Wink of Stella over the vase, spiders and spiderwebs to give it a shimmery feel. 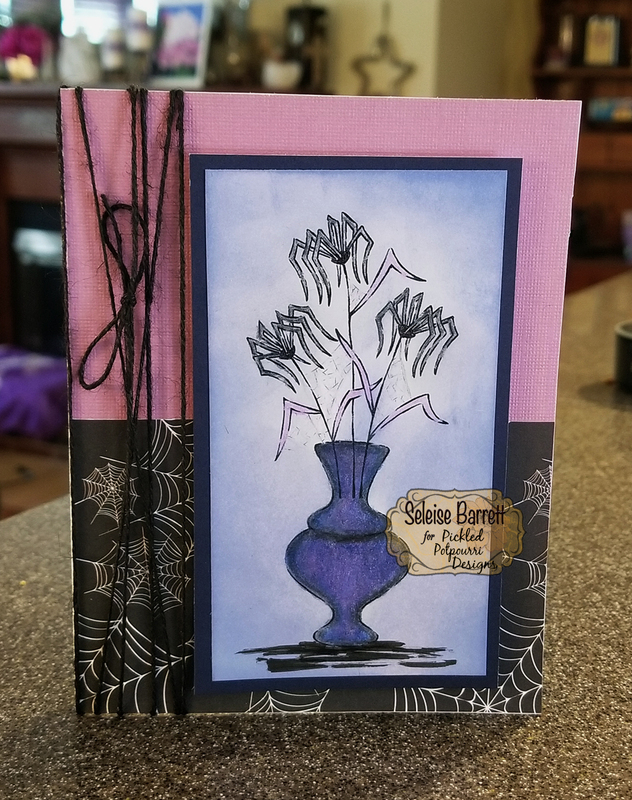 It adds to the spooky, mysterious feel of a spider bouquet. If Halloween is not your thing, no problem. 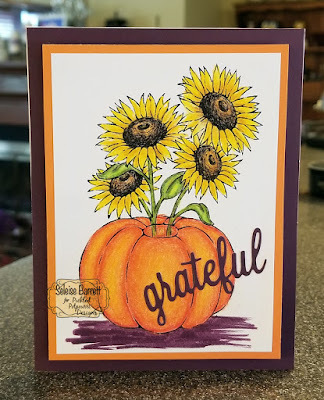 How about a lovely sunflower bouquet in a pumpkin holder? The image is colored with prismacolor pencils and a distress marker was used to ground the image. The fall colors really pop in a combo of orange and purple, don't you think? And, the image is so cheery - it would definitely bring a smile to a friend or family member. We have much to be grateful for so how about sharing the gratitude with those who have made your life better by being in it! Thanks for popping by and be sure to check out this digi set and all of the other great digis at Pickled Potpourri Designs.